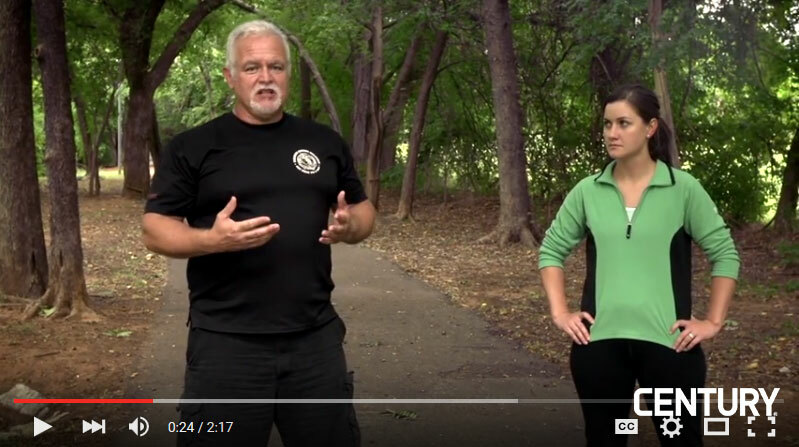 Founder and Chief Instructor at Fighting Systems Unlimited Paul Webb teamed with Century for a series focusing on basic self-defense moves for all ages. This video shows how to defend from an attacker trying to choke you from the front. These instructional videos should be used in addition to and not in place of real-life martial arts training. As the attacker grabs your throat you and pushes you back, step back with your left leg while bringing your right arm up and over both of the attackers’ arms. At the same time twist your torso toward the back leg to gain leverage over the attacker. This position allows you to easily elbow the attacker in the chin. You should aim for the jawline or right above in case they move back in anticipation of the elbow strike. Place both of your hands on their right shoulder and knee them in the stomach. Depending on how strong they are and how hard your knee strikes land, you may want to throw several knees. Run away and yell for help. Do not stay where your attacker is. You don’t know if they have friends waiting or how long they will stay down. Get away as fast as possible and call for help. Century Martial Arts has a variety of items available for your self-defense and martial art needs. From kubotans, training knives, and training weapons, we have the items you need for your martial art training.